It hurts my pride a little that Russia/Ukraine has not yet produced a metal act which would gain a worldwide acceptance. Do not get me wrong, there is plenty of metal going on in what is former Soviet Union, and a lot of it is internationally recognized. However, most of the respected bands are still fairly underground, especially if we are talking about a sprawling BM scene. The widely accepted act I am looking for is a more mainstream, less extreme band appealing to more than a kvlt circle. The absence of such a band may in part be due to the fact that many Russian bands are singing in Russian, although using your native tongue does not seem to hinder many other bands, especially Scandianvian. However, I have to admit I haven’t been to the land where I was born for practically 13 years, so my “expert” opinion may not be that valid. Yet, when The Aerium debut Song for the Dead King landed on my desk I really wanted to like these guys. Young band with a hot looking brunette female vocalist, The Aerium made a good first impression. The looks and potential only go so far, the band had to deliver musically to maintain my affection. The promo sheet wrongly draws comparisons to Nightwish. You can find no power metal structures on the album. The connection must have been made because of the vocalist. Veronika Sevostjanova is not just an operatic female singer. She is a full blown opera quality soprano – mezzo-soprano. Unlike Nightwish where Tarja puts a face on the band, but also is a part of an overall fabric, Veronika totally dominates the sound with just about every melody siphoned through her vocal chords. She is a blessing to The Aerium, but the guys also have to learn how to come out from under Veronika’s huge shadow. Enough of those Nightwish comparisons, however. The Aerium is a gothic band, and if you have any doubts, eyeliner worn by a couple of guys in the band should confirm it. 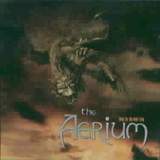 The Aerium delivers their gothic stylings with mostly mid-tempo songs where guitars are reduced pretty much to some background riffing. There is not enough heaviness in production to call it a crunch. Keyboards, by far, is a dominating instrument, the frozen synth sound being very reminiscent of early Dismal Euphony. The whole atmosphere, in fact, does invoke Norwegian gothic bands with soprano female vocals. This is The Sins of Thy Beloved without the Beast – there are no harsh male vocals to be found on Song for the Dead King, there are no male vocals on the album period, except some processed voices in Queen of Snows. The choice obviously to be a symphonic gothic operatic band The Aerium deviate little from the formula only rarely accelerating a little (Queen of Snows) with some riffing vaguely similar to black metal and some double bass/blast moments (Treasure Hunter). Most of Song for the Dead King is done at stately storytelling speed and melodies ranging from tender and tragic (Midnight, title track) to laying it on a bit too thick. Potential and good melodic feel notwithstanding, The Aerium definitely need more variation with their songs as the blurry line between the tragic opera and boring goth is becoming really thin on Song for the Dead King. Beautiful Veronika’s vocals and all, I guess I am still waiting for that grand Russian metal act to wow the world.